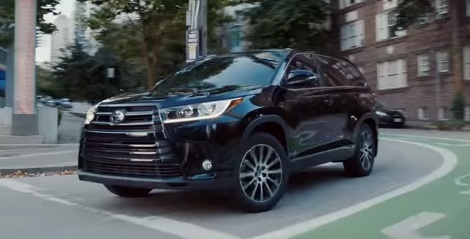 Toyota shocases the 2018 Highlander in a hilarious new commercial, focusing on the SUV’s roomy interior, which gives enough space to seat up to eight people, as well as on its technoly, that makes any drive a lot more fun, including 8-in. high-resolution touch-screen display, integrated navigation and integrated SiriusXM Satellite Radio compatibility. The spot, titled “Pick Up”, features a young man driving the 2018 Toyota Highlander through town and taking his grandfather and three of his grandfather’s friends, one with a cappuccino, another one with his “very rare” pomchichi dog, and another one with a sports bag, at a basketball court. On the way, his grandfather, hearing the song playing in the car (“I Am” by L Pro), changes the station to Soul Town, where the track “Fire” by Grace Love and the True Loves is playing. As they arrive at the basketball court, they all get out of the car decided to show the rookies who’s boss. The spot ends with the onscreen lines “We make it a Toyota. You make it a sports car.” and with the voiceover saying the automaker’s tagline, “Let’s Go Places”.